Jalopnik runs the El Dorado Touring Club's George's 278th Road Rallye… and wins! WARNING: Absolutely no cool cars were used in this rallye. With a Saturday afternoon to kill and a full tank of gas, what else is there to do except enter a road rallye? 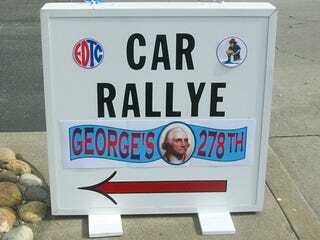 The El Dorado Touring Club in Northern California held their monthly coursemarker gimmick road rallye and attempted to entertain (and confuse) the local rallyists with a George Washington's birthday-themed event. The club went all out with the theme and had coded route instructions, complete with wax seal, to hand out. Once the drivers and navigators opened their instructions they headed out onto the route searching for coursemarkers to help guide them along the way. Information from the coursemarkers would also assist the teams in decoding additional instructions. The rallye is designed to trick teams into going along a certain route, while the "correct" route would offer more points. An example of a gimmick during the rallye was in the General Instructions it said the word "wood" would not appear on any signs. The Route Instructions told the teams to turn right at "Shadowood." Since the word "wood" didn't exist, the sign actually read "Shado" and didn't meet the requirements for the instruction to turn right. Teams that didn't turn on "Shadowood (or Shado)" would be rewarded with a coursemarker up the road which would earn them 10 points. Trust me, the gimmicks only got harder from there. After driving around scratching their heads and mostly lost for three hours all of the teams eventually made it to the finish to be rewarded with some slick looking plaques (who doesn't love trophies?) and pizza (hey, who doesn't love pizza?!). Winning the First Timer class was driver Tom Randle behind the wheel of a Ford Escape with his navigator David Garcia bringing in a score of 890 out of 1,000. The Jalopnik entry winning the Beginner class was driver Rob Krider piloting a Hyundai with Gus Krider navigating them to a score of 950/1,000. The Novice class was won by driver Brandon Just beating up a VW Rabbit navigated by Kevin Liebig with a score of 900/1,000. In the Senior class driver Jeffrey Martin in a Toyota Prius sort of saved the environment and won a rallye with the help of his navigator Antonio Contreres with a score of 940/1,000. The Expert class was won by driver Rita Geraghty and navigator Mo Geraghty in a Honda Insight (which they called a Prius without the gas pedal problems). They scored 990/1,000 -the highest score of the event. The "big brains" class, Master Expert was won by The Rallye Club's own driver Don Best and navigator Cris Wendt with a score of 980/1,000. They took the high road in a Toyota Highlander. To learn more about road rallyes or to find one in your area checkout the The Rallye Club or El Dorado Touring Club.